How to take a perfect Bread Stapled to a Tree Photo rule #1. Never shoot from below. Hold your phone/camera up above your head and shoot down. “It’s most flattering to shoot bread from above,” explains Kicky Pie. This also prevents creating a double crust in the shot. How to take a perfect Bread Stapled to a Tree Photo rule #2: Avoid bread-on pics. First, figure out the slide of bread's best side: is it the front or the back? Experiment by taking pics of the bread and tree and see which looks most flattering. For the prettiest bread on tree photo, tilt the slice slightly down and to the best sliced side. How to take a perfect Bread Stapled to a Tree Photo rule #3. Watch the crust. 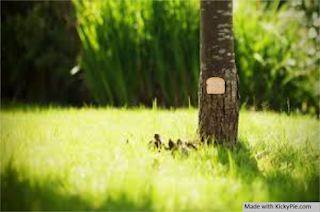 Sure it’s a bread stapled to a tree photo , but it doesn’t have to look like it's unnatural. “Keep the crust sides out of the shot and avoid having your fingers in the frame shot"
How to take a perfect Bread Stapled to a Tree Photo rule #4: Accentuate the slice. Squeeze the slice slightly to give it a slim effect in line with the tree. How to take a perfect Bread Stapled to a Tree Photo rule #5. Lighting is key. Position the slice so that rays of sunlight fall softly on bread, which creates a flattering, tasty effect. “Be sure to have the sun in front of you,” — shooting with the sun behind you can create unwanted shadows on slice of bread. How to take a perfect Bread Stapled to a Tree Photo rule #6. Add a filter. If you couldn't get capture enough slice lighting in the shot or if the photo isn’t exciting enough on its own, add a filter to the image for dramatic, look-at-my-slice urgency to your bread stapled to a tree photo. How to take a perfect Bread Stapled to a Tree Photo rule #7: Smile smart. How to take a perfect Bread Stapled to a Tree Photo rule #8. Background matters. The fact that bread stapled to trees is even a thing is no reason to perpetuate the insensitive practice of snapping a photo at the most inappropriate of moments. “Pay attention to the backdrop”. “You don’t want the bread on a tree taken in a burning forest". How to take a perfect Bread Stapled to a Tree Photo rule #9. Show off a little. “People are fascinated by where your bread is.” Whether you’re in the forest, at the beach or in a cave, make sure your pic captures a sense of place—along with your slice of bread. How to take a perfect Bread Stapled to a Tree Photo rule #10. Have fun. “Don’t take the bread or the tree too seriously” Consider how unselfconsciously radiant your slice photographs when you’re having fun. Be the bread. That way you create an album of photos that are true to the entire loaf. Snap! The KickyPie blog will showcase some of our new and interesting designer tools and discuss some of the features and techniques for image and photo design with the KickyPie designer platform. PLease enjoy.